Produced by Dave Watson and Icarus Witch. Mastered by Mark Richardson. Bands have a hard time gaining their musical footing if there isn’t some level of consistency in the line-up — such has been the case, since 2005, with Icarus Witch. The Pennsylvania band has gained a reputation as a solid, hard-working ‘traditional metal’ act, but they have yet to deliver a defining record. Those that have followed Icarus Witch know they’ve had issues with guitarists and drummers, but when they lost singer Matthew Bizilia they stepped right into White Wizzard territory. This left founding member and bassist Jason Myers in ‘rebuild’ mode and pressing forward in seeking the new voice of the band. The new singer of Icarus Witch is Christopher Shaner, who’s powerful and dynamic voice is what will take the band to the next level. 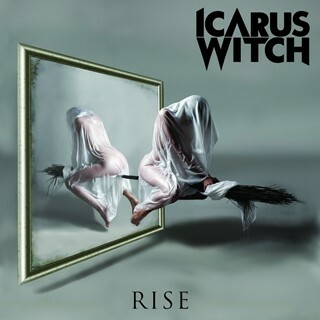 The new album is called Rise and it’s appropriately titled as this will be the album that will take Icarus Witch from an ‘average’ traditional metal act to ‘edgy’ modern rock ‘n’ roll band with roots in metal. In addition to the revamped line-up, the great album title, and fantastic artwork, the production sonically brings out the best in Icarus Witch — something that has been sorely lacking on previous efforts. Manning the controls was guitarist Dave Watson and Icarus Witch, thus keeping everything related to the production of Rise in-house, and proving to be a brilliant move. As much I enjoy Rise I wonder if the longtime fans will embrace the new direction? Rise will earn Icarus Witch new fans, there’s no question about it, but at the same time the new commercial and accessible sound will have some fans doing an about face. There are several killer cuts on Rise with my personal favorites being the anthems “(We Are) The New Revolution” and “Pray” which have great hooks, fantastic sing-a-long choruses and would sound brilliant in a live setting. The radio friendly “Break The Cycle” and the aforementioned tracks are destined to receive a lot of airplay on modern metal or rock radio alongside current and contemporary bands. I’m also quite fond of the title track “Rise” and “In The Dark”, and while I’m not a huge fan of ballads I understand the need for the inclusion of one — without ‘pussifying’ the band Icarus Witch gives us “Nothing Is Forever” and it fits in nicely on Rise among the heavier cuts. You can envision the lighters and the cell phones raised to the sky as Shaner belts out the song. Icarus Witch has shed the ‘power metal’ label for a more modern approach and now the possibilities are endless. While Rise might not be ‘the’ defining album it will be kicking down some doors — and that is exciting.